Pasta seems to get a bad rep these days and it's a shame because it's not all bad for you. I whipped this meal up for a quick weeknight meal and it's a pretty healthy dish that's light on the budget and the palate. It's full of flavor, loaded up with good for you veggies, and so easy and fast to make! 1 lb spaghetti or angel hair pasta, cooked according to package directions. 1. Cook onion and carrot in butter, over medium-low heat, for about 3 to 5 minutes or until starting to soften but still slightly crisp, stirring occasionally. 2. Add garlic and cook for about 1 minute, stirring often. 3. Add zucchini and cook until tender crisp. 4. Stir in tomatoes with juice from one can. 5. Add salt, pepper and sugar and simmer until hot. 6. 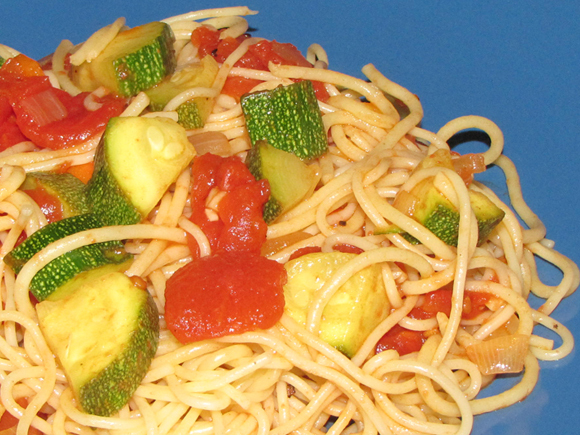 Toss with spaghetti and serve.